Back pain, neck pain or injury? We can help. For expert advice and treatment you can trust. BACK at EASE provide specialist osteopathic and musculoskeletal therapy services to Towcester, Northampton and the surrounding areas. Osteopathy is a manual form of medicine which treats pain and injuries. We recognise that when you have an injury in one area of your body, your whole body may be affected or contributing to the pain and therefore take a holistic approach to managing your pain. £48 for 45 minutes. Includes full medical and musculoskeletal assessment, neurological testing, Osteopathic treatment and rehabilitation advice. BACK at EASE offers appointments to suit your lifestyle, with appointments available from 8am until 6.30pm, The Brook Health Centre, Towcester. Please be prompt for your appointment time and if you need to cancel or reschedule, give a minimum of 24 hrs notice to avoid being charged you for the appointment. All patients will be emailed or given printed rehabilitation guidance to assist them in their recovery. We use a wide range of gentle techniques such as stretches, soft tissue massage and joint mobilisations and manipulations as well as giving you tailored rehabilitative and injury management advice. Treatment is different for every patient and tailored to their unique needs, age, and fitness. Some treatments may cause a little local discomfort at the time for the next 24 hrs but this is a normal and healthy response to treatment. Sometimes when we manipulate joints they click. This noise is just air in the joint capsule and a normal response to a joint being moved. You may have already experienced this sensation if you crack your knuckles. We aim to keep your appointments to a minimum and do not promote reliance on treatment. Therefore we ensure all patients receive rehabilitation exercises and take the time during your consultations and through our online resources to ensure that you understand how to perform these exercises. See our Pilates Therapy page for details of our Pilates classes which may assist your recovery and prevent further injuries. We carry out detailed postural assessments by looking at your posture, testing the strength and flexibility of specific muscles or joints and finding areas which are tight or sensitive to touch or movement. When we have done this, we will explain to you in language that you understand what we believe your diagnosis is and give you an honest opinion of your treatment options, whether we think you will benefit from treatment and approximately how long we expect it to take. Do you need to see a Doctor first? No, you do not need to see your doctor first if you are paying for your own treatment. However, some insurance companies require you to see your doctor first, please check with your insurer before booking an appointment. Before we do any treatment on you we will conduct a full medical assessment including a detailed case history; orthopedic, neurological and any relevant clinical assessments. If at any point it is deemed that you may need further tests such as x-rays or MRIs or an assessment by your GP, you will be referred to the appropriate professional. What should I wear to my Osteopathy appointment? As with any medical examination, you may be asked to remove some items of clothes, so please wear something you are comfortable in. You are free to wear shorts and a vest top if you would be more comfortable this way. Towels will also be used at all times to ensure your comfort. Yes – if you wish, you can have someone present throughout your consultation and treatment. Minors under the age of 16 are requested to bring a parent or guardian to their consultations. Please check your insurance prior to attending treatment, they may require a GP referral. We are currently registered with WPA, Pru-Health, Remedi, Medisure, BCWA and Simply Health. Other insurers may provide cover for your treatment with us so please call for details 07880 750 258. To qualify, an Osteopath must study for four to five years for an undergraduate degree. This is similar to a medical degree, with more emphasis on anatomy and musculoskeletal medicine and osteopathic techniques. 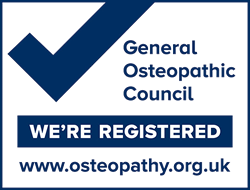 By law, Osteopaths must register with the General Osteopathic Council (GOsC). The British Medical Association’s guidance for general practitioners states that doctors can safely refer patients to osteopaths. 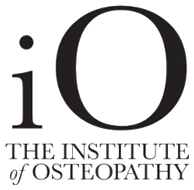 BACK-at-EASE are a member of the Institute of Osteopathy (iO) the UK’s leading professional membership organisation for registered Osteopaths. The purpose of the institute is to unite, promote, develop and support the Osteopathic profession, to improve public health and patient care. Osteopathy is a gentle and effective hands-on approach to healthcare, based on the principle that the way your body moves influences how it functions. Osteopaths are highly competent healthcare professionals, recognised by the NHS as fully qualified to diagnose and treat independently. Their iO Patient Charter outlines the consistently high standards of service they encourage their members to aspire to and that you can expect from a registered Osteopath who is an iO member. BACK-at-EASE are registered with the General Osteopathic Council who regulate the practice of osteopathy in the United Kingdom. The General Osteopathic Council work with the public and osteopathic profession to promote patient safety by registering qualified professionals, and setting, maintaining and developing standards of osteopathic practice and conduct.